There actually is a Republican senator with a brain. Sen. Steve Daines (R-MT) is proposing an amendment to the Republican healthcare bill that would implement a government-run, single-payer insurance system in the United States. This is what Barack Obama and Democrats wanted all along. Obamacare was set up to fail, as it has, and destroy the private healthcare insurance industry so that single payer would take over. Thanks to some ignorant, selfish, cowardice and gutless RINO’s, it actually looks like that is where we are headed. Sen. Steve Daines looks to put Democrats on record for single payer. However, Democrats will probably vote against it as they could care less whether they are on record or not. This has all become one big game at the expende of the American people. Take a good listen to what Obama had in store all along and the Republicans were played like a fiddle. Long before he ever became president, he was a proponent of government run single payer. Because the VA, Medicaid and Medicare are so well run and financially solvent. This is the biggest lie ever perpetrated on the American people as Democrats told We the People we could keep our insurance plans, doctors and hospitals if we likes them. It was all an effort to get to single payer and it appears that most of the GOP could care less. Sen. Steve Daines is proposing an amendment to the Republican healthcare bill that would implement a government-run, single-payer insurance system in the U.S. The Montana Republican doesn’t support single-payer healthcare. But in a bit of political gamesmanship often seen in Congress, Daines wants to force vulnerable Democratic senators running for re-election in red states in 2018 to take a position on the liberal healthcare policy, which is gaining currency on the Left. The Senate is considering legislation to partially repeal Obamacare. The floor debate process is poised to enter the amendment phase, during which senators can offer hundreds of proposals to alter the underlying bill. Daines’ single-payer amendment is a carbon copy of one offered in the House by Rep. John Conyers, D-Mich. The Conyers bill, with more than 100 Democratic cosponsors, proposes to create a program the legislation describes as “Medicare for All.” According to the bill’s language, “all individuals residing in the United States would be covered.” To pay for the program, Conyers proposes raising income taxes on the top 5 percent of earners, plus hiking taxes on payroll and self-imployment income, unearned income, and stock and bond transactions. Democrats who support the bill might vote against the amendment anyway on the grounds that it’s a political stunt. Republicans continue to struggle in their effort to pass an Obamacare repeal bill. Their legislation, being considered under special rules that prevent it from being filibustered, can only lose two Republicans and still advance. SAY GOODBYE TO OBAMACARE … THE PRICE IS RIGHT. President-elect Donald Trump has chosen Rep. Tom Price (R-GA) to be the next head of the department of Health and Human Services. 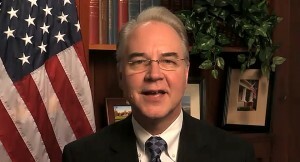 Price is a fierce critic of the not-so Affordable Care Act, known as Obamacare. Look for Price to repeal and replace the failure that is Obamacare. As reported at the Politico, Price is an orthopedic surgeon and has been a longtime opponent of the Affordable Care Act, which the president-elect has pledged to repeal and replace. The Georgia congressman was an early supporter of Trump’s and endorsed him for president last May. President-elect Donald Trump has chosen Rep. Tom Price (R-Ga.), a fierce critic of the Affordable Care Act and a proponent of overhauling the nation’s entitlement programs, to lead the department of Health and Human Services. Trump also named Seema Verma, a health-care consultant who was the architect of Medicaid changes in Vice president-elect Mike Pence’s home state of Indiana, to run a crucial section of HHS: the Centers for Medicare and Medicaid Services. As HHS secretary, Price would be the nation’s top health official and the incoming administration’s point person for dismantling the sprawling 2010 health-care law, which Trump promised during his campaign to start dismantling on his first day in the Oval Office. The 62-year-old lawmaker, who represents a wealthy suburban Atlanta district, has played a leading role in the Republican opposition to the law and has helped draft several comprehensive bills to replace it. The GOP-led House has voted five dozen times to eliminate all or part of the ACA but has never had a chance of accomplishing its goal as long as President Obama has been in the White House. Remember when President Barack Obama promised that Obamacare would reduce the number of expensive ER visits as access to other kinds of care was expanded? But of course this is the same signature piece of legislation where Obama promised that you could keep your own doctor, hospital and insurance plan if you liked them. Those were all lies as well. When the majority of people that are signing up for it are doing so as a form of medicaid, of course the ER is going to be used as a clinic. It doesn’t take a brain surgeon to figure that one out. 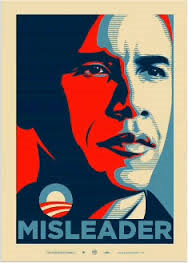 But of course Obama was going to lie through his teeth to the American people to get Obamacare passed, as Jonathan Gruber said, they had all considered the stupidity of the American voter to be key. With the healthcare expansion last year, many are watching how the Affordable Care Act affects emergency room use. President Obama has promised his signature health law will gradually reduce expensive ER visits as access to other kinds of care is expanded. Critics contend newly insured patients — especially those enrolled in Medi-Cal, the state’s low-income health program that picks up most patient costs — aren’t likely to seek care elsewhere, and will overwhelm emergency rooms. Neither of those outcomes were clearly evident in the first months of the new healthcare system’s operation in Los Angeles County, according to a Los Angeles Times analysis. Data hospitals report to the state show that as insurance coverage was extended to hundreds of thousands of residents, ER visits for ailments not serious enough to require an admission grew 3.9% in the county in the first half of 2014, compared with the same period the previous year. The growth is in line with annual increases of 3% to 5% in the three years prior to the federal healthcare overhaul. If you like your plan, you can keep your plan. If you like your doctor, you can keep your doctor. It will prevent people from going into debt. ObamaCare will lower costs overall. More Americans will be insured. Speaking Tuesday at the National Press Club in Washington, DC, New York Democrat Sen. Charles Schumer had an epiphany and stated that “Democrats blew the opportunity the American people gave them” after the 2008 election. Schumer went on to say that, “We took their mandate and put all of our focus on the wrong problem, health care reform.” Gee, ya think? Sen. Schumer was one of the 60 Democrat senators who passed Obamacare, with not one GOP vote, and forced the unpopular law down the throats of Americans. Now suddenly because as we predicted back then, it would be their undoing, Schumer has misgivings that Democrats focused on it first and did not focus on what Americans were dealing with on a day to day basis, a poor economy and unemployment. 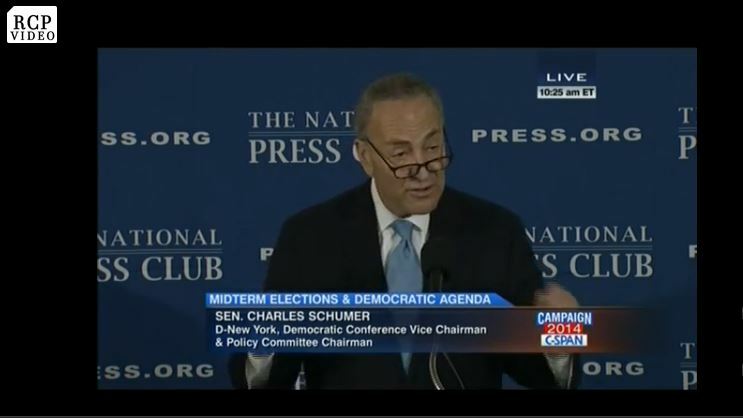 Schumer told those in attendance “that considering 85% of all Americans got their health care from either the government, Medicare, Medicaid, or their employer … we would still only be talking about only 5% of the electorate.” Wasn’t that the same argument that those opposed to Obamacare were making in 2009? Why blow up the healthcare system in the United States for only 5% of the people? This is a kin to demolishing a house because the back porch needs repair. Not only did Democrats not listen to the people, the law they forced upon them was nothing more than a lie. Democrats made a strategic mistake by passing the Affordable Care Act, Sen. Charles Schumer (N.Y.), the third-ranking member of the Senate Democratic leadership, said Tuesday. Schumer says Democrats “blew the opportunity the American people gave them” in the 2008 elections, a Democratic landslide, by focusing on healthcare reform instead of legislation to boost the middle class. But why is Sen. Schumer talking about the Democrats disastrous decision to pass Obamacare now, is it because they have buyer’s remorse and care about the American people? Not at all, it is because they have taken a political shellacking in 2010 and 2014 and now find themselves in the minority in the House and the Senate. It all has to do with power, not the people. Honestly, who in their right mind thought that an unpopular bill that adversely affected so many people to only benefit a few would not have ramifications? If Democrats could not see that, then they deserve what they got. SEN. CHUCK SCHUMER (D-NY): After passing the stimulus, Democrats should have continued to propose middle-class oriented programs and built on the partial success of the stimulus. But unfortunately, Democrats blew the opportunity the American people gave them. We took their mandate and put all of our focus on the wrong problem — health care reform. Now the plight of uninsured Americans and the hardships caused by unfair insurance company practices certainly needed to be addressed, but it was not the change we were hired to make. Americans were crying out for the end to the recession, for better wages and more jobs, not changes in health care. This makes sense, considering 85% of all Americans got their health care from either the government, Medicare, Medicaid, or their employer. And if health care costs were going up, it really did not affect them. The Affordable Care Act was aimed at the 36 million Americans who were not covered. It has been reported that only a third of the uninsured are even registered to vote. In 2010 only about 40% of those registered voting. So even if the uninsured kept with the rate, which they likely did not, we would still only be talking about only 5% of the electorate. To aim a huge change in mandate at such a small percentage of the electorate made no political sense. So when Democrats focused on health care, the average middle-class person thought the Democrats are not paying enough attention to me. Again, our health care system was riddled with unfairness and inefficiency. It was a problem desperately in need of fixing. The changes that were made are and will continue to be positive changes, but we would have been better able to address it if Democrats had first proposed and passed bold programs aimed at a broader swath of the middle class. Had we started more broadly, the middle class would have been more receptive to the idea that President Obama wanted to help them. The initial faith they placed in him would have been rewarded. They would have held a more pro-government view and would have given him the permission structure to build a more pro-government coalition. Then Democrats would have been in a better position to tackle our nation’s healthcare crisis. EXIT QUESTION: So why is Sen. Charles Schumer making these comments about Obamacare? Maybe because Schumer does not want to be the next on the list of 29 Democrat Senators who are no longer in the US Senate who voted for Obamacare. 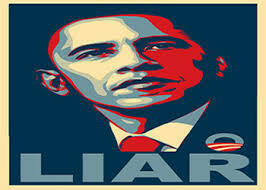 Didn’t Barack Obama say that Obamacare was going to lower costs … Guess who lied again? As reported at the Washington Post and direct from CMS, The Centers for Medicare and Medicaid Services, 65% of small businesses are expected to experience increases in their premium rates while the remaining 35 percent are anticipated to have rate reductions.” According to the report, 11 million American workers will be faced with higher premiums. CMS released the report on Friday with little fanfare. Neither the HHS website nor the CMS website shows a news release or public notice about the report. Imagine that. No one is saying that there did not need to be some adjustment to the delivery system of health care insurance, however, penalizing 65% to benefit the 35% was and is not the answer. Nearly two-thirds of small businesses that currently offer health insurance to their workers will pay more for coverage as a result of new rules in the health care law, as will millions of small-business employees and their family members, according to new estimates released by the Obama administration. The Centers for Medicare and Medicaid Services, which has spearheaded the implementation of the law, has acknowledged that new rules requiring insurers to offer guaranteed coverage and renewal options to small employers will likely drive up the price of insurance for some companies. So will rules banning insurance companies from varying their rates based on factors like a company’s industry or the age of its employees. “We are estimating that 65 percent of the small firms are expected to experience increases in their premium rates while the remaining 35 percent are anticipated to have rate reductions,” CMS’ Office of the Actuary wrote in a new report. Conversely, “the effect on large employers is expected to be negligible,” because most large companies run their health insurance programs in house. Some premiums will be reduced; however, the overwhelming majority of individuals, some 11 million, will see their premiums increased. Mind you, this is just small business, we are not even discussing businesses with more than 50 employees. Consequently, according to the estimates, which the agency says are based on industry research and conversations with insurance experts, roughly 11 million of the 17 million individuals who have health care plans through a small employer will see their premiums increase as a result of the law, while 6 million people will enjoy lower premiums. If accurate, it would continue a steady climb in insurance costs for many small businesses. Ninety-six percent of small businesses say their premiums have increased in the past five years, with the average monthly insurance cost soaring from $590 per employee in 2009 to $1,121 in 2014, according to poll released earlier this month by the National Small Business Administration. Imagine being penalized for having a healthy work force? One would think that programs implemented by a business like “Healthy Life”, would lower insurance premiums, not raise them. Nope, not with Obamacare. This is all part of the distribution of wealth. The six-page document looked at companies with fewer than 50 workers that offer employee health benefits, but it calculated health care costs in a hypothetical way – leaving out the impact of government subsidies that are specifically geared for small businesses. Without factoring in government subsidies, CMS concluded that 65% of those small businesses would see an increase in premiums. Why? The report found that those companies had been paying below-average premiums, thanks in large part to having younger and healthier workers. But under Obamacare, neither pre-existing conditions, nor the lack of them, can influence the cost of premiums. So those small companies with healthier workers will see premiums rise to match the average for all workers.